Friday night marked the start of my son's senior year of swim season. As you recall, he decided to join the team last year after not playing any sports in high school in the previous years. It was such a good experience for him that he decided to do it his senior year as well. The meet was held at Waukesha North, a competing school in the city. 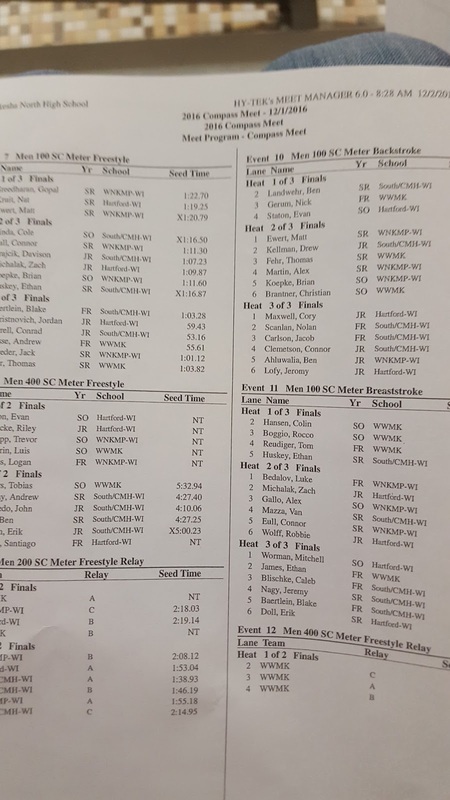 It was a "compass meet" which I think means all the Waukesha teams South, North and West. There were a handful of other teams as well, including Mukwonago and Homestead. Of course I went to the meet to cheer him on. I always forget how much I enjoy watching swimming events. The summer Olympics always find me glued to the swimming events watching Michael Phelps break records and take home medals. They help me appreciate what really goes into the training and competitiveness of the sport. I am a fledgling swimmer - one who loves the water, but can't do much more than crawl/back float out to the island every year at the cabin. This is not an insignificant distance, but crawling/back floating is not really swimming. Or is it? I don't know. So when I see these boys doing a stroke as difficult as the butterfly and the backstroke, I have nothing short of great admiration for them. My sister in-law who coaches girls swimming once tried to give me some pointers on doing the butterfly but I ended up looking more like a man who'd just seen a shark and was trying to notify people. It's actually on a videotape somewhere, I think. My admiration holds true for the breast stroke and freestyle. None of them look easy. I've often mentioned that I would like to one day learn how to swim freestyle (or any of them, really) because it is such a great sport for your health. Maybe in retirement. And I might be a big sap, but there were a number of times I got kind of choked up at the meet. Like the time the Freshman from a competing school was struggling as the last kid in during the 400 meter freestyle. The whole natatorium was cheering him on as he floundered and pushed himself. It reminded me of Ben's first 200 yard backstroke race, where the whole place was cheering him on. It sounds weird I know, but in these days of political yuck, things like this restore my faith in humanity at times. Maybe if we all plugged for one another a little more instead of insulting one another's political party in the comments of the latest expose, we'd be a better world. Or the multiple times I saw teammates cheering on their teammates, regardless of what place they were in during the race. I also really like it when the winner of a race is congratulated by the second place guy - or vice verse. It is the ultimate Team/Individual sport, much like Track and Field. These boys are trying to improve their personal bests and help their team at the same time. It is a beautiful show of sportsmanship and something that is refreshing compared to all the chest thumping and grandstanding we see in football and basketball. And then there was the fact that this was the first of the last. The last few times I will see my boy compete in a high school sport. That reality is one I'm having a hard time dealing with. Talk to me next fall when the house is deathly quiet. Those will be strange days. Plus, I get really wound up watching some of the close races. 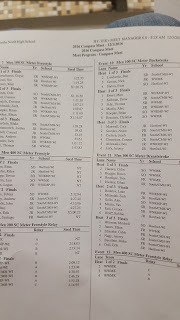 Waukesha South has a really good swim team, one of the top in the state, and many of their races have them finishing 1, 2 and 3. It is fun to see them competing even against their own teammates. Ben did well in his first meet of the year. His times were up a bit from the end of last year, but that's to be expected given that it's been 9 months since he swam competitively. He'll improve and finish strong, of that I'm certain. He really enjoys his friends on the team and loves being part of it all. And, if you ask me, that's what it's all about.